Only available for 62mm & 64mm turbo sizes. Learn about the HLX Upgrade. Hellion has taken Ford truck performance to a new frontier with the introduction of a Twin Turbo “Eliminator” system for the 2011-2014 Ford SVT Raptor and 2011-2014 F-150 6.2L. This system features the same 100% stainless steel construction and precision CNC quality as the original Eliminator system, so you know that you can trust this system to last. With stock driveability, easy bolt-in installation and tire shredding power, this system is the ultimate in Raptor performance. The top mount kit is adjustable from 5 psi to over 25 psi. The 7psi setting will make over 650 hp at the engine with stock cats/stock exhaust. The kit has the ability to make over 1200rwhp if a built engine is chosen. What’s the difference between the tuner system and complete system? The complete system includes injectors, programmer, and tuning. The tuner system does not include those items. If a tuner system is purchased you will need to take your vehicle to a dyno facility for tuning. 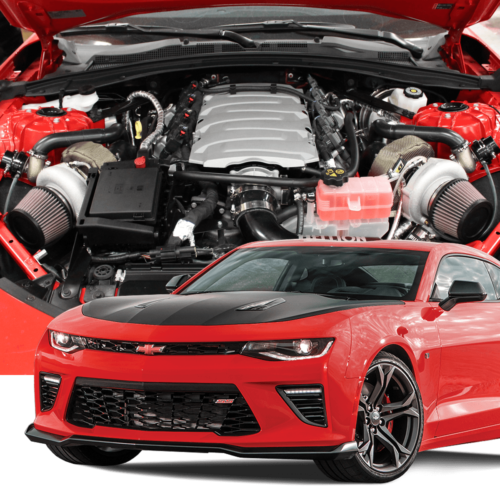 How does The Eliminator twin turbo system compare to a supercharger? The Eliminator twin turbo system is very comparable cost-wise. 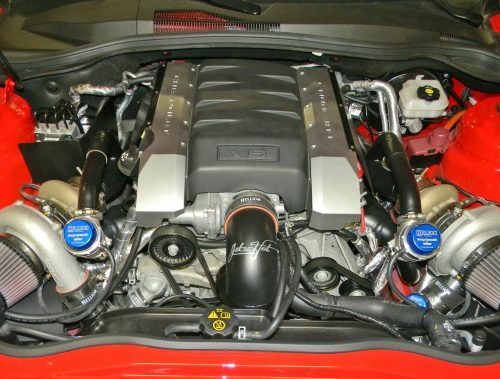 To maximize a supercharger, aftermarket headers will be needed, adding to the cost. The Eliminator twin turbo system includes headers, adding to it’s value. 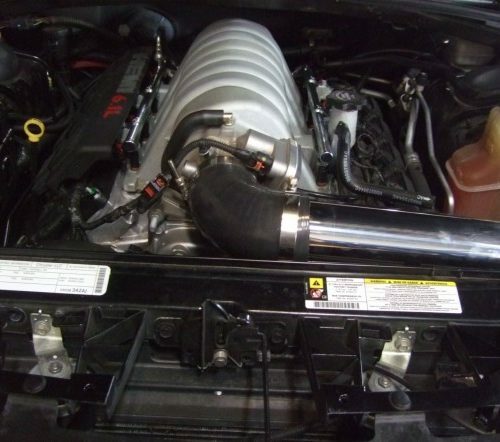 The Eliminator twin turbo system has a broader power band than comparable superchargers. For example, a supercharger makes peak horsepower at peak RPM, let’s say 6,500 RPM. A turbo will make peak power at a lower RPM, say 4,000 RPM. The turbo will then carry the power to redline. The supercharger will have a lower bhp at 4,000 RPM. The turbo will have no parasitic loss as the supercharger is belt-driven. The turbo is driven with spent exhaust gases. Is it overkill to have a twin turbo Eliminator system even if I only want to run 5lbs of boost? No. This system was designed to operate from 5lbs to over 30lbs if desired. Most customers only run 5lbs of boost, which in the case of The Eliminator, will make an average of 550rwhp (over 600 horsepower at the crank). Turning the boost up with a turbo is as easy as changing the wastegate spring or adding a manual or electronic boost controller. Does The Eliminator system need heat wrap or ceramic coating? Not necessarily. The customer can run the system wrapped, coated, or bare. Hellion offers many choices if heat reduction is desired. Can I keep my factory catalytic converters? 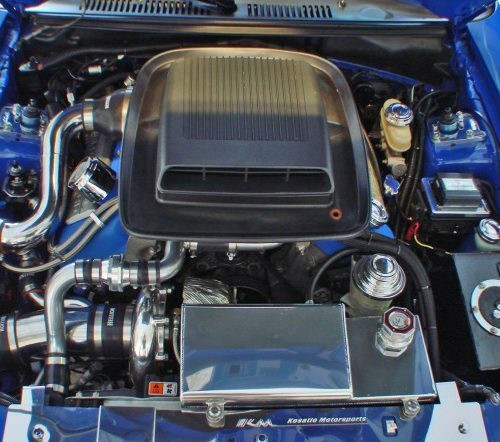 What is the advantage of purchasing an American made turbo system from Hellion? Using CNC bent stainless steel crafted by certified welders and fabricators ensures a perfect fit every time. Lifetime warranty on all stainless steel piping. CEA engineered Precision turbochargers featuring state of the art Pro Mod influenced V-band design. Unsurpassed tech support and assistance. Having been touted as the company that revolutionized the Mustang turbocharging industry, we are continually contacted by our competitors customers seeking tech support. In many cases the customer was unable to contact and/or receive support from our competitor. It is our pleasure to support the turbocharging industry regardless of brand or place of purchase. What is the difference between log manifolds and tubular headers (as used in The Eliminator system)? A tubular header will lower restriction and allow higher flow from the engine to the turbocharger (compared to a restictive log manifold). All Hellion headers utilize state of the art tubular design. Do I have to bring my car to Hellion Power Systems for installation? 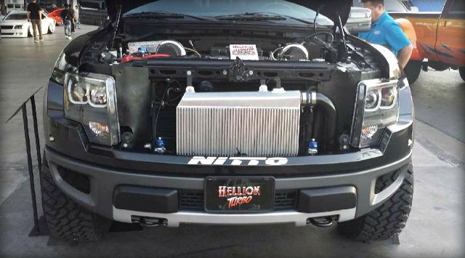 No, it is not necessary to bring your car to Hellion Power Systems for installation. We ship our systems world-wide with many customers installing our systems themselves. If you need help with your installation or would like a shop referral please call us at 505-873-4670.